This paper investigates the integration of clinico-pathological and microRNA data for breast cancer relapse prediction. Clinical and pathological data proved to be relevant in making predictions about cancer disease outcome. The most accurate predictive models can be obtained by using clinico-pathological information together with genomic information. We analyzed the performance of various combinations between twenty classification algorithms and thirteen feature selection methods. 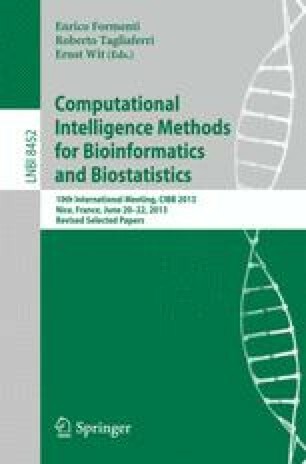 The best performer was the regularized regression method Elastic Net, using its built-in feature selection method, on the data set integrating clinico-pathological data with microRNAs. The hybrid signature contains four clinico-pathological features and fifteen microRNAs. We also evaluated the influence of the separation of patients according to ER status and the impact of the exclusion from the data set of HS molecules (novel microRNAs without an assigned miRBase ID) on the overall performance. Functional analysis of the microRNAs of the best classifier showed that they are involved in cancer related processes. This project has been conducted through the program Partnerships in priority areas - PN II, developed with the support of ANCS, CNDI - UEFISCDI, project no. PN-II-PT-CACM-2011-3.1-1221.